Possibly the Best Composter on the Market! The vast majority of the wastes produced by the average household can be recycled. Luckily, a lot of people are starting to understand this, and recycling programs and instructions are clearly paying off. The result is that households produce much less waste that ends up in landfill sites. One of the key ways in which this has been achieved is through the use of at home composting. If you are preparing yourself a meal, look at what is being thrown out. Things such as peppers and tomato tops, potato skins, banana peels, eggs shells, and tea bags can all be composted. That salad you didn’t eat and has wilted can be reused. Instead of throwing those things into your garbage, you should put them in a composter. The question then becomes, which composter should you use. 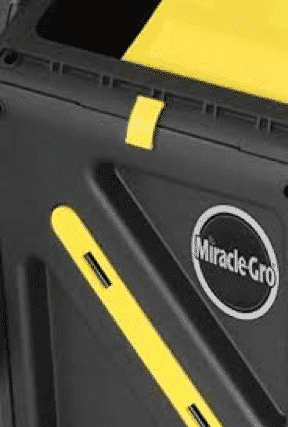 One key product is the Miracle Gro DC270MG. But why is this such a good product to consider? It comes with dual compartments so that you can efficiently compost garden and home waste. The aeration system allows for quick composting. It has mixing bars to make the entire process quicker and easier. It is built to last and easy to put together. It can hold a lot of compost. It is available for just $84.96. The Miracle Gro tumbling composter is fitted with two chambers holding 18.5 gallons (70 liters) each, making compositing really convenient. As a gardener, you will be able to use one chamber for usable compost, while the other is being composted. The device is made up of heavy duty materials, meaning it can be left outside regardless of the season and used all year long. It has been designed for those new to composting and for those who require compost quickly, with easy to use features such as internal mixing bars and side locking mechanisms that allow loading and unloading to be easier than ever. It is also very easy to assemble and it has a metal base for added strength. Clearly, the composter has been designed to make life easier and more convenient for the gardener. It isn’t a huge device that takes up lots of space. Rather, it looks quite nice and not out of place in a garden. Additionally, since it has two chambers, it is much easier to manage composting. When you receive your Miracle Gro, you will notice that it comes with a clear to understand instruction booklet, making it very easy to set up. You can start composting within a few minutes of receiving your package. It has been designed to be easy and convenient to use, in other words. The device is very effective and incredibly powerful. Most importantly, it benefits your life and that of the planet as a whole. Any vegetable scraps, garden waste, leftover fruits, can all be loaded into the container, providing you with fantastic compost in no time. With many tumbling composters, turning them is quite difficult. Not so with this composter, however, which actually makes it quite a lot of fun. It really teaches you about the process of composting and the natural cycle of decomposition, giving you a renewed interest and love for gardening and sustainable practices. The Miracle Gro Tumbl﻿er is a great time saver, because it takes just a couple of months to have your first batch of compost ready. When you consider how much time and effort it would take to build a manual compost, which can easily take up to a year, it is easy to see why so many people opt for this particular model. ​It is very easy to set up and use. Because it has two chambers, you can use compost from one bin, while the other is still being processed. Unloading the compost is also very easy, because it has a wide lid that covers the containers’ openings. All you need is a bucket, and you’re good to go. There is no need for manual scooping of the compost, or for the provision of a lid to stop odors. The presence of the rotators means that the compost is always fresh and decomposes very quickly, enabling you to have your first compost batch in just two months or so. It is a low budget composter and this is noticed in some of the materials. While it is built to last and stay outdoors regardless of the season, you will notice that some of the parts are a bit cheaply made. You need to regularly check all the parts are in order and still firmly attached. While it does have two drums, it is not big enough for professional gardeners. Is The Miracle Gro Right For Me? Professional gardeners with a huge amount of garden waste. ​Composting is something everyone should engage in. It helps save the planet by reducing the amount of waste that ends up in the landfill. At the same time, by composting, you give back to the earth, as you can use your compost to fertilize your garden once it has been completed. For many, however, composting seems very complex and that it takes up too much space and effort, unless they invest hundreds of dollars in it. 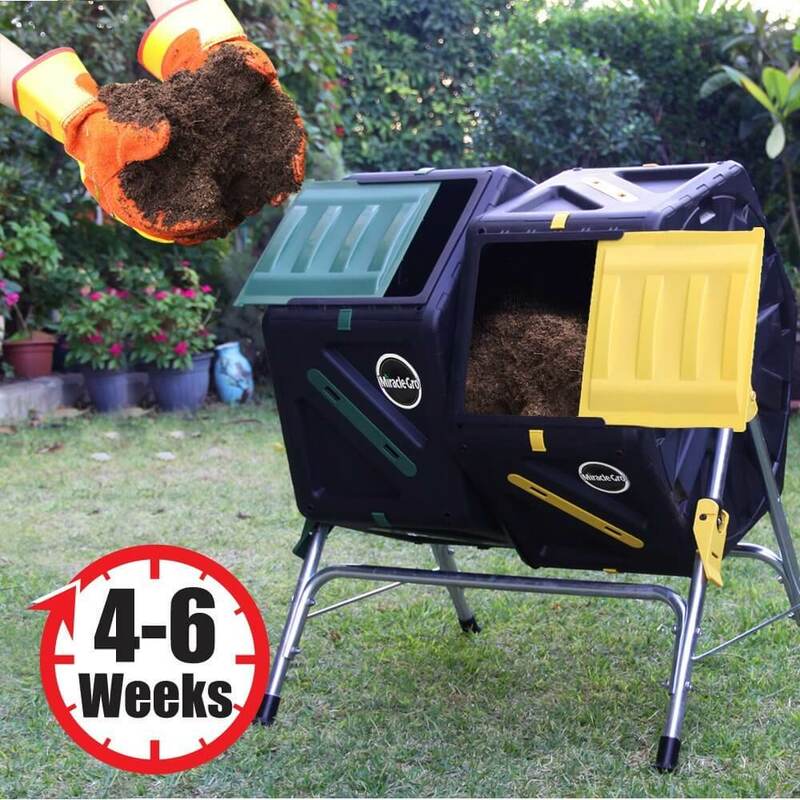 This product, however, is affordable, comes with two bins, is easy to tumble, composts very quickly, and sets up in just minutes. 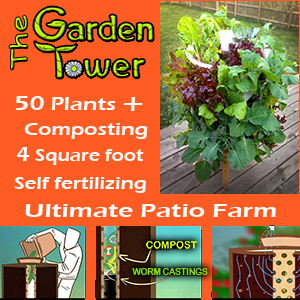 If you want to have clean, healthy compost for your garden and you care about the planet that is left for the next generations, then this is the product for you.